The Days are gone when there was the use of Traditional Recruiting Services.The Recruiters used to post the Job ad in Local News paper,Local listings,Posters all over the city and in the news.This old traditional way of recruiting candidates for the job involved lot of spending of time and resource for posting ad and promoting it.This would allow only few audience of particular region to come across the ad posted by the company and apply for it. But this has been replaced with Modern Recruiting Strategies where the Company’s Post their Job Listings in Online Job boards and their website or any social media. The free plan is the basic one and it provides the recruiters with the basic features to post their jobs and they have access to only limited Resume.One doesn’t need to pay for this plan you can just create a recruiter account and then sign up and start posting the job and it will go live on our website. . This second package is a recommended plan if the recruiters are serious about their job posting.This provides the access of Premium Hot Listing(unlimited) and the job is seen by more audience.Silver plan has the benefit of Various job boards sharing as the job posted using this plan will be posted to multiple job boards which allows greater audience to access the job.This comes with a Fee of 49$ per Year. This Package gives the premium lifetime access.the jobs posted will be listed on premium hot listing ,will be shared to multiple job boards ,access to full resume(unlimited) ,support and assistance from our side. Jobisite is a Free job board which provides the user with greater flexibility.you don’t have to spend money if your company’s budget is low you just post your Job ad by choosing the free plan.It just requires you to create a new account and fill all the details regarding the Job and provide an effective job description,and then you are done your job will be posted on our website and will be shared with large number of audience.However, if you are serious about the Recruiting process and you want your job posting to be on premium list then you can choose either Silver or Gold package which requires you to pay some Fee,then you can post the Job and your Job ad will be shared with multiple Job boards where ever greater number of audience will see it.Jobisite has partnered with multiple Job boards for Publishing the jobs in various job boards which allows the job to be posted to several people.Premium jobs in jobisite.com are shared in multiple job boards. It is not as expensive as compared to other job boards and with just $10, your job gets shared in multiple job boards, aggregators and social networks. 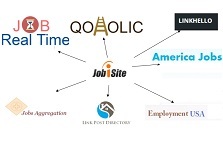 The multiple job boards partnered with jobisite are JobRealtime,linkHello,LinkPostDirectory,EmployementUSA etc. If you are not sure about Subscribing to this premium Job listing you can always give it a try with a 30 days Free trial which helps in knowing how the job posting works and you can see the response.The payment is secured with Paypal and there’s no need to worry about it.You can cancel this anytime if you happen to not like it,just as we said earlier we provide our users with flexibility.